Buskers are street performers who may be (but not limited to being) actors, singers, musicians, jugglers, mimes, human statues, magicians, or puppeteers. A busking group cannot consist of more than (4) people without written permission from BFM staff. Performers engaging in any activity with more than (4) people or requiring more space than allotted at our Buskers locations including but not limited to, acrobatics, tumblers, or cyclists must contact Market staff, via letter or email, to seek special permission and/or identify alternative locations for their performances. Visit the information booth. 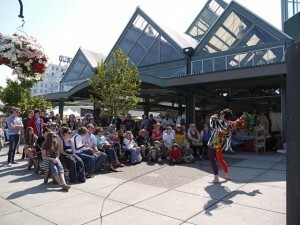 There you will read and sign the “Busking Rules and Regulations.” Busker permits are $20 for a seasonal permit paid with cash, check or money order (made payable to Bellingham Farmers Market). This fee is for a BFM busking permit. You will receive a badge and are responsible for keeping the badge and bringing it with you each time you perform. Replacement badges cost $3 each. There are no sign up sheets for busking. Buskers show up at the market each Saturday and use verbal communication with each other to figure out who is in line for each spot. Buskers can perform at each spot for 30 minutes from the time they start performing. After 30 minutes buskers must move to a different spot, even if no one is waiting. Where Can Buskers Set Up? Various locations have been designated as places where Buskers can perform. The market has 4 spots open from 10 am to 3 pm and one spot that can be reserved ahead of time for larger groups or groups that draw a large crowd. Buskers can perform between 10AM and 3PM on Saturdays. Each spot is on a first-come, first-serve basis. You mush rotate to a new spot after 30 minutes regardless of whether or not another performer is waiting for your spot. Please note that due to space constraints anyone wishing to perform at the Wednesday Market must email and reserve space ahead of time. 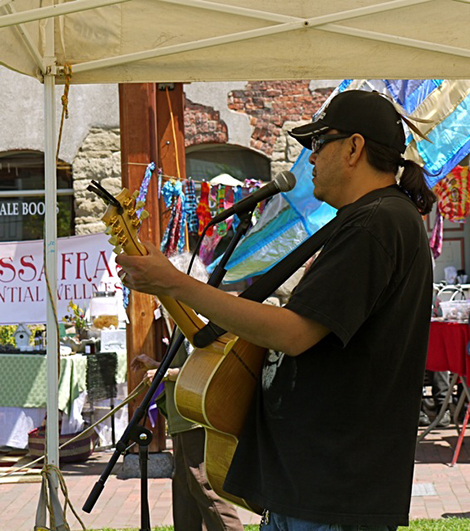 If you are interested in entertaining at the Wednesday Market, please email market@bellinghamfarmers.org to sign up for a time slot to perform. NEW: Musicians may ONLY perform original music or music in the Public Domain (any Song or Musical Work Published in 1922 or Earlier.) We currently do not have a license to cover performances of copyrighted music. All material must be considered family-friendly. Obscenity or indecency will not be tolerated. It is the busker’s responsibility to manage crowds that gather around their performance to make sure that foot traffic is able to reasonably move around their performance. Your daily badge must be displayed at all times. Buskers without badges will be asked to leave the Market immediately. Only one badge holder is necessary per group. Performances shall only take place at the times and locations designated by BFM. You may perform for 30 minutes from when you start playing. You must rotate to a new spot after 30 minutes even if no one is in line for your current spot. Performers cannot ask for money but may place a donation basket in one location; it cannot be passed around. Performers may sell CDs and/or tapes, but they cannot sell anything else. Performers are responsible for clean-up of all litter at the performance site. Knives, swords, torches, flames, axes, saws or other objects that can cause bodily injury to any person are prohibited. Amplification devices are prohibited without prior written permission from BFM staff. Use of power sources located in the Depot Market pavilion, outside sheds or anywhere on the Market site is prohibited unless approved by BFM staff. Repeated violations of the above rules may result in suspension or termination of busking privileges at the Market.